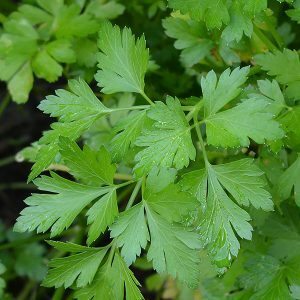 Parsley plants are one of the more widely used herbs of all and it is easy to grow from seed. Propagating parsley from seed does have its advantages, you will have access to more varieties, and it is cheaper than buying seedlings. Sometimes seen as simply a garnish, however it is actually very good for you. Growing your own will give you an almost constant supply, and it will be fresh. Unlike most herbs, this is one that prefers a little afternoon shade, and even dappled light, depending on the type and the climate. This is a plant can be grown in the ornamental garden as well if desired. Growing Parsley in the home garden is not difficult so why not grow a little of each of the varieties available . All varieties are easy to grow from seed. They can take a little while to germinate however germination rates are generally good. Seed can be collected from the previous years flowers or seeds heads, and stored in a cool dry place ready to sow in spring. The seeds themselves are very small and are difficult to sow evenly spaced, so you will need to sprinkle them them the best you can and thin or divide them later. This is the technique we use. You can use a normal potting mix with some seed raising mix on top.The fine seed raising mix allows for good contact between the seeds and soil and will help speed up germination. If you do not have any seed raising mix, simply sieve some of the potting mix to form a nice layer. One trick to speeding up the germination of seeds is to scarify them in hot water. 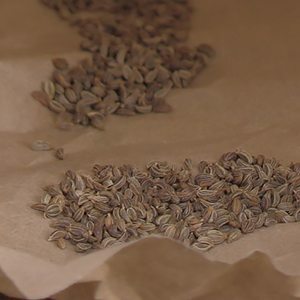 You can do this by soaking them over night, or simply by sowing the seeds in grooves in the seed raising mix and gently pouring a little hot water over them. The seeds are then covered with a fine layer of seed raising mix, or sieved potting mix. This method usually ensures germination in around 3 weeks. If you have sown the seed directly into the container you wish to grow them in, you can simply thin out as needed. If you are growing parsley indoors, use a grow light above the seedlings if you do not have adequate lighting. The small seedlings can usually be pulled from the soil and them replanted if required. Choose the right position for you chosen variety. Prepare the soil by weeding and adding extra compost and cow manure. Use a dibbler to make the planting hole and this will prevent the tap root from being damaged. Plant the seedings at around 6 – 8 inches (15 -20 cm) apart. Keep the plants moist at all times. In containers or pots, use a good quality potting mix, again with a little added compost. Water regularly with a liquid seaweed fertiliser and in no time at all you will have a happy healthy pot of parsley. You can grow parsley indoors over winter as long as in receives adequate light. The curly leaf variety is stronger tasting and needs more shade and moisture. (pictured right) . The flat leaf variety or ‘Italian’ . This has a slightly milder taste and is a little easier to grow. Frise Vert Fonce, a French variety with curled leaves uses for making Persillade’ suace. It is a little later and a little stringer tasting than others. Hamburg Parsley is a variety that tastes a little different and is dual purpose. The taste is a little like parsnip and roots are a little larger than other varieties, and are used in soups and stews. The leaves are used as a garnish. Arat Parsley is similar to above, both the roots and foliage are used. All types prefer good soil with lots of compost dug in, some added cow manure and your efforts to grow it are well on the way to being successful. We use a liquid seaweed fertiliser every few weeks and some vermicaste tea from the worn farm when available. Easily harvested with a pair of scissors, just remember to leave some leaves so the plant can regrow. It is best harvested and used as fresh leafy green. It can be dried, or stored in a refrigerator, however it tends to lose its taste. You can also keep it fresh for a few days by placing the stalks in a glass of water. In Australia this is not really necessary unless you just do not have space outside. In which case you could look a sunny window sill. Good morning sun is best as the hot afternoon sun through a window can be very drying and even burn the leaves. The real trick is to use a deep pot, as we mentioned parsley likes to send down a long tap root. The other factor is regular watering, if drys and then you water and let it dry again it will tend to go to seed, so a constant moisture level is best. This is especially true when growing indoors in a pot as they do tend to dry out. The Classic Parsley Recipe is Persillade Sauce. This is a part of French cuisine and has many variations. The basic recipe is a 50/50 mixture of finely chopped parsley and garlic. We use the following recipe and add it roast potatoes close to the end of cooking. We simply saute the roast potatoes in the persillade with some extra butter until the garlic is cooked off a little. It also goes well with roast chicken. Also good with fresh fries. 1/2 to 1/3 cup of finely chopped parsley. 1 to 3 cloves of garlic, finely chopped.